The Table Properties panel is displayed when you select a table (inserted in your page) by clicking its associated glyph or when the <TABLE> tag is selected in the Tag Selector. In the Element ID text box (displayed in Simple view) enter the value for the id attribute. It will uniquely identify the element (table) in page. In the Width text box (displayed in Simple view) specify a new width for the table. The width can be given in either number of pixels or percentage of the page width. If you enter the width in pixels and the value is greater than 1000, a pop-up window will display the error message: "The value must be lower than 1000." The default width of the table is rather tight (each column expands wide enough for the space character to fit inside). In the Height text box (displayed in Simple view) specify the new height of the table. The height can be given in either number of pixels or percentage of the page height. If you enter the height in pixels and the value is greater than 1000, a pop-up window will display the error message: "Value too big! Must be less than 1000." Usually though, the table height is not set because it changes (increases) anyway as you type text in the table cells. The default height of the table is rather short (each column expands deep enough for the mouse cursor to fit inside). In the CellPad text box (displayed in Simple view) specify the number of pixels between a cell’s content and the cell's borders (cell padding). The default value is 2. In the CellSpace text box (displayed in Simple view) specify the number of pixels between adjacent cells (cell spacing). The default value is 2. In the Border text box (displayed in Simple view) enter the thickness (in pixels) of the border that you want displayed around the table. The default value is 1. To make the border invisible, set this attribute to 0. 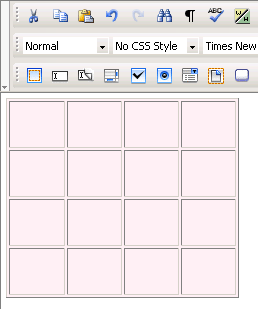 Note: When the table border becomes invisible, the inside cell borders also become invisible. In the Header Rows text box (displayed in Simple view) enter the number of rows that you will use as the table header. They will be included in the <thead></thead> tag. 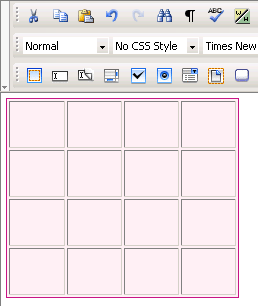 You can definite CSS rules for this tag in the KT_styles.css file (included in the package) so that the header rows will have a specific look. In the Footer Rows text box (displayed in Simple view) enter the number of rows that you will use as the table footer. They will be included in the <tfoot></tfoot> tag. 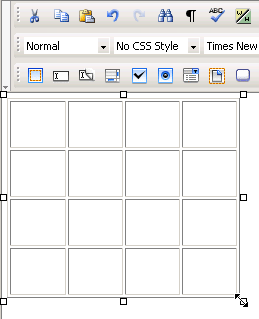 You can definite CSS rules for this tag in the KT_styles.css file (included in the package) so that the footer rows will have a specific look. Note: When talking about header and footer rows, you must see the table as having three categories of rows: header, body, and footer. There cannot be header rows without footer rows. So if you enter a numeric value in one of the text boxes and leave the other one blank, the latter will be automatically filled with the value 1. The sum of the two values entered cannot be greater than the number of table rows minus 1 (at least one row must correspond to the table body). So if you choose to work with header and footer rows, and the second value you enter is greater than the maximum admitted, it will be automatically decreased to that allowed maximum value. By clicking the Advanced button (displayed in Simple view), the Table Properties panel will switch to Advanced view. You will be offered the possibility of setting advanced options for the currently selected table. In the Caption text box (displayed in Advanced view) enter the text that you want displayed as the table caption (name for the table). 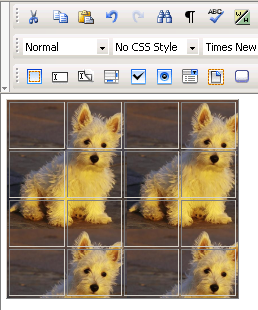 The <caption></caption> tag is included in the <table></table> tag. In the Summary text box (displayed in Advanced view) enter the value for the summary attribute. Top - caption displayed above the table. Bottom - caption displayed below the table. Note: It is your task to make sure the image has appropriate dimensions, as automatic resizing of the image to the table's dimensions will not take place. By clicking the Simple button (displayed in Advanced view), the Table Properties panel will switch to Simple view. You will be offered the possibility of setting various options for the currently selected table.